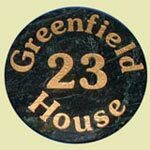 We have lots of House Number Signs and Door Numbers to suit all house styles and all budget. Everything from rustic timber to classic polished brass to modern clear acrylic. Click on the links below for more information an each of the materials. 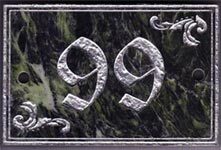 The granite and marble door numbers can be cut from 15 different stones and painted with many different colours. It may only be a small sign but with a little bit of imagination your number sign can be really unique. 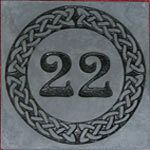 There are several materials we can use for engraved house numbers. Acrylic laminate is light weight, good value yet very durable. The engraved corian looks and feels just like stone yet can have detailed wording or images engraved into it. Engraved brass is classic and very traditional, but does need cleaning. 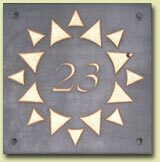 Engraved aluminium has a clean modern look and has the advantage of being maintenance free. Images and wording can be included if required. 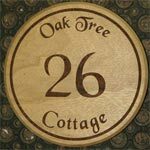 These are very traditional and long lasting house number signs. The cast aluminium is painted and has a durable baked finish. The cast brass is solid and heavy and available in various background colours. 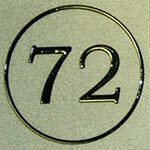 This coloured faced aluminium is ideal for small maintenance free house signs and numbers. As you can see we can add very detailed illustrations and borders. The colours available are black, blue, green, red and dark bronze. 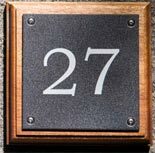 Be seen day or night with reflectives house numbers on composite aluminium. These signs look crystal clear like glass and are ideal for a modern look. Apart from an occasionally wash no other maintenance is needed.